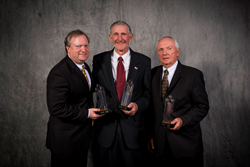 Three men who built RE/MAX Suburban into the most successful RE/MAX franchise in Illinois and one of the largest in the United States were recently honored by the RE/MAX Northern Illinois network with a special Entrepreneurial Excellence Award at the 39th Annual RE/MAX Awards Ceremony. RE/MAX Northern Illinois recently presented its Entrepreneurial Excellence Award to (from lfeft) Jim Nelson, Jr., Bob Baker and Jim Nelson, Sr.
Three men who built the most successful RE/MAX franchise in Illinois and one of the largest in the United States were recently honored by the RE/MAX Northern Illinois network with a special Entrepreneurial Excellence Award at the 39th Annual RE/MAX Awards Ceremony. Bob Baker and Jim Nelson, Sr., founded RE/MAX Suburban in 1977, and over the next 38 years built an outstanding organization consisting of seven offices and more than 200 brokers. Along the way they were joined in the management of the business by Nelson’s son, Jim Nelson, Jr. RE/MAX Suburban now has offices in Arlington Heights, Buffalo Grove, Glen Ellyn, Libertyville, Mt. Prospect, Schaumburg and Wheaton. In the most recent national ranking of residential real estate brokerages by REAL Trends magazine, which was based on 2015 closed transactions, RE/MAX Suburban ranked 16th among all RE/MAX franchises and 173rd among all brokerages nationally. For many years, RE/MAX Suburban has been the largest RE/MAX franchise in Illinois, and over that time, its top executives continued to make major contributions to the success of the RE/MAX Northern Illinois region and the broader real estate industry. RE/MAX Suburban has also played a vital role in the support RE/MAX provides to Lurie Children’s Hospital of Chicago (formerly Children’s Memorial). For more than 20 years, RE/MAX Suburban consistently has been the leading fund raiser in the RE/MAX Northern Illinois network, making contributions totaling more than $400,000. Last year, the three men concluded it was time to pass the organization on to new leadership and agreed to sell the company to Chad and Sarah Gilbert, a young, energetic couple with impressive business credentials. The award presented to Baker and the two Nelsons is a testament to the enduring legacy of success that they built over nearly four decades, not only for RE/MAX Suburban, but for the RE/MAX brand in the Chicago metropolitan area.